This is a very basic property that is in the main an older structure only partly renovated. There are no handicapped units, but otherwise it is acceptable. The cottage was spotless and they had everything you could imagine if you forgot anything it was probably there all you need to bring was food and drink. Should you choose to vacation in Greenwood, do think about pre-booking a room as early as possible, because there's not a wide range of hotel and apartment options near Greenwood's downtown. There are only a handful of accommodation options within an easy walk from the center of Greenwood. The Best Western Aurora Inn is an ideal choice as it's only 3 kilometres (2 miles) away. The Best Western Aurora Inn as well as the Rocky Shores and Seals Cottages are two Expedia-listed accommodations to explore. The Best Western Aurora Inn is 2 kilometres (2 miles) away from downtown Greenwood. The Rocky Shores and Seals Cottages can be found 19 kilometres (12 miles) away. Or, you could investigate booking a room at the Middleton Motel & Suites. This Expedia-listed hotel can be found 12 kilometres (8 miles) from the middle of Greenwood. Kentville is 35 kilometres (22 miles) to the east of Greenwood and is home to the Kentville Bird Sanctuary and Island Green Golf Club. Expedia-listed Kentville hotels are the Slumber Inn and The Greensboro Inn Motel. 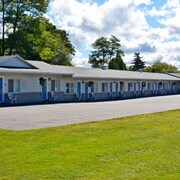 60 kilometres (39 miles) to the east of Greenwood, you'll find Windsor, which is home to the Super 8 Windsor and Downeast Motel. Whether you're just passing through or staying in Windsor, don't miss the Mermaid Theatre of Nova Scotia and Ski Martock. Before you say goodbye to Wolfville, ensure you experience some sport. Visit Harbour Station to the west of Greenwood. Book a hotel right near the action at the Hilton Saint John or the Delta Hotels by Marriott Saint John. Now you've checked out accommodation options in Greenwood, be sure to check out Expedia's Greenwood travel guide for all the latest on the many great attractions in this area.